Showing 39 articles from January 30, 2019. FRANKLINTON -- Town commissioners approved a rezoning that paves the way for an 100-unit apartment complex, a move they believe can spur commercial development. The decision comes on the heels of town approval of two apartments -- a total of 19 units -- in separate ends of Mason Street. CASTALIA -- You want broadband service in the unserved corners of Franklin County? It's going to take enough customers willing to sign up and enough of an incentive for the county to make it worth a vendor's while. That was the message that Joe Freddoso delivered to a community group and Franklin County commissioners over two days this week. Liquor by the drink pressures building; Will county move? LOUISBURG -- For the second time in two months, a proprietor has asked the county to look into allowing establishments to sell liquor by the drink. Commissioner Michael Schriver said it may be time to do more than listen. In December, Michael Hicks, who operates Bud's Tavern between Youngsville and Wake Forest, told commissioners that just selling beer is a tough business to maintain. 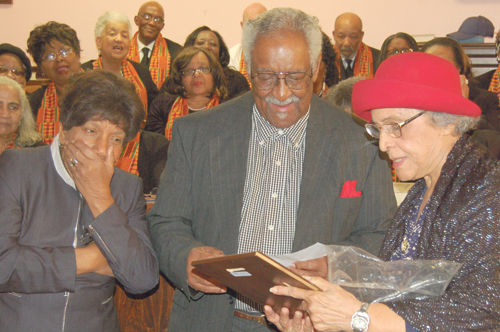 LOUISBURG -- An election and a governor's appointment will allow a former representative in the state's General Assembly the opportunity to continue her public service. On Jan. 23, Gov. 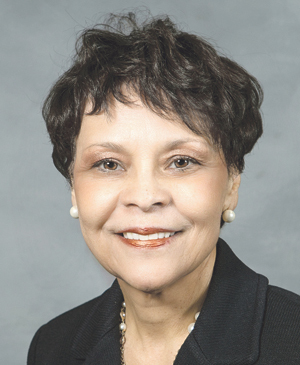 Roy Cooper appointed Bobbie Richardson to the Board of Directors of the Golden LEAF Foundation -- a General Assembly-chartered group designed to aid economically distressed communities with funds generated by the 1998 tobacco settlement. LOUISBURG -- More people. More trash. That was the message Solid Waste Director Brian Haynesworth delivered to county commissioners last week as he shared with the board the opportunities and challenges facing solid waste now and into the future. Now that we're temporarily past this whole government shutdown insanity thing -- mostly because even the gas bags in Washington had to finagle a way out -- there is one simple fix than can keep this from ever happening again. 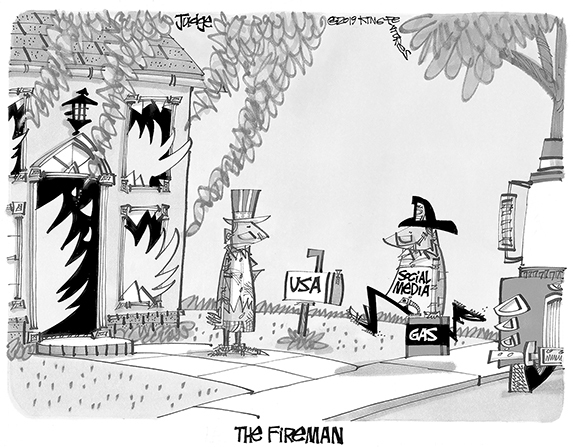 We need to flip the entire system around, putting the pressure on those responsible instead of making pawns of those who are working hard, many of whom are just trying to keep the rest of us safe. We should commend the Franklin County commissioners for a good start. But we also need to remind them that what they have done is but the first step down a very long road -- on a journey that will last for years. Last week the commissioners awarded a contract to update the county's Comprehensive Development Plan -- and that will cost a lot of money, roughly $166,000 for this first version. I don't usually have such recall for government meetings, but when the county's clerk of superior court walks in and tells a governing body that she comes bearing gifts -- in this case, about a million bucks left in a Louisburg businessman's estate -- you tend to remember those things. 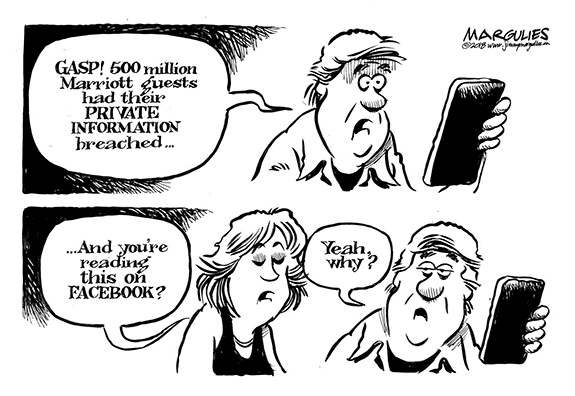 It was Feb. 8, 2010. I just wanted to give honor to the Franklin County Sheriff's Department for the job that they do. It was 14 years ago when my home near Bunn was broken into and a shotgun was taken. On Jan. 14, 2019, 14 years later, I received a phone call from Detective Woody, who at that time gave me the news that my shotgun had been recovered. On Jan. 21, 2019, he placed it back into my hands. 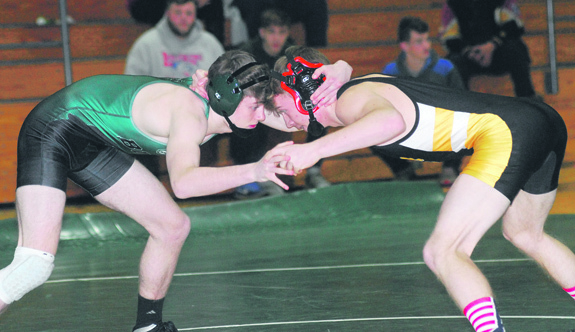 STANHOPE -- Wilson Fike continues to be the standard bearer for wrestling in the Big East Conference. 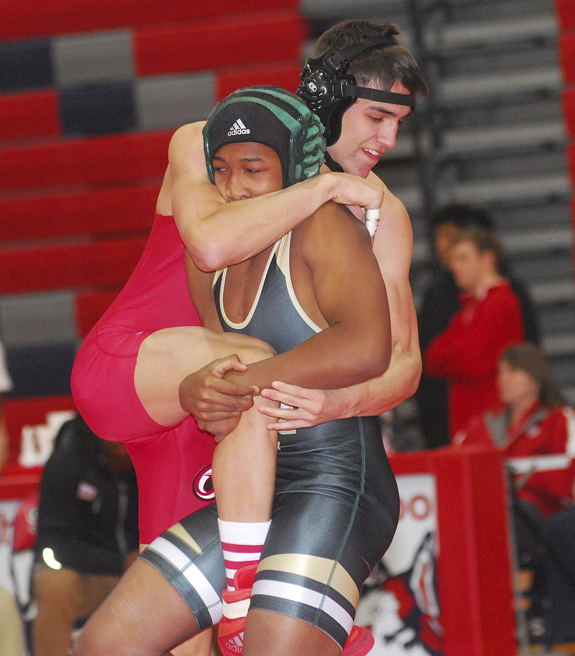 After winning the league's team championship one week earlier, the Golden Demons boasted six weight-class champions during last Saturday's Big East Individual Tournament at the Southern Nash High School Gymnasium. GRAPPLING. Bunn High School's Sam Kagarise (left) locks up with his opponent from Roanoke Rapids during last Wednesday's Northern Carolina Conference wrestling match at the Bunn Dome. 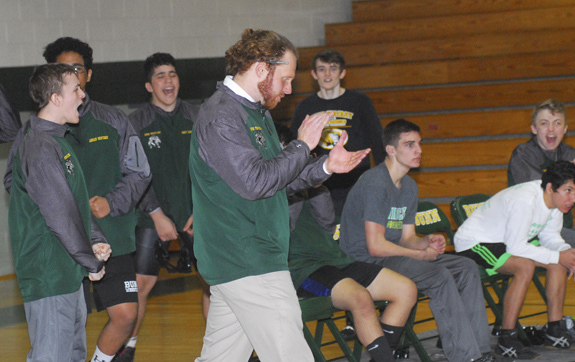 BUNN - Over 20 years after starting the program, Bunn High School finally has its first league wrestling championship. And it was worth the wait. And the suspense. 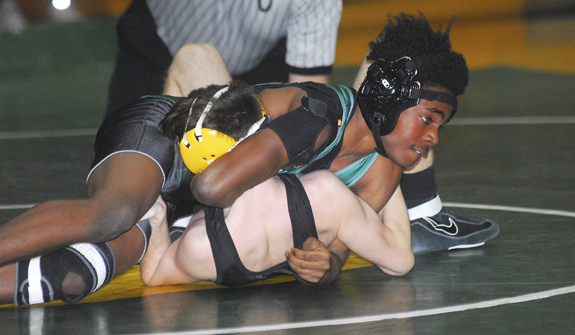 For the Wildcats, their opportunity to claim the Northern Carolina Conference regular season team mat title would come down to a dual match last Wednesday against long-time rival Roanoke Rapids at the Bunn Dome. 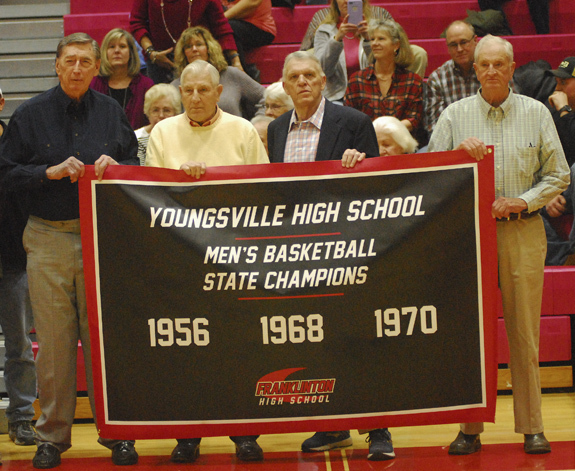 YOUNGSVILLE -- Younger generations might not know about the amazing exploits of the Youngsville High School boys basketball squad. But thanks to a new banner at the Franklinton HS Gymnasium, maybe some curiosities will be piqued. 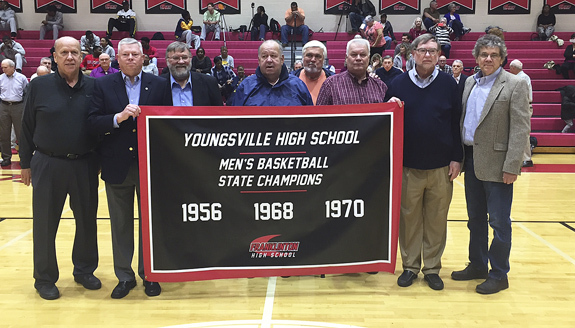 Youngsville was consolidated in the late 1970s, but not before the school produced some of the best basketball talent ever produced in Franklin County. 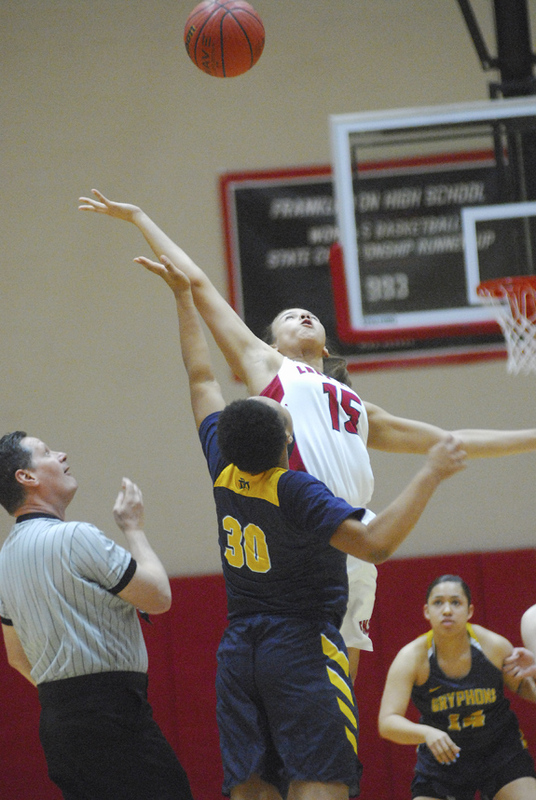 SMITH SOARS FOR FHS. Rebekah Smith controls the opening tip for the Franklinton Lady Rams. FRANKLINTON -- It's official -- the Big East Conference's girls basketball standings are quite the mess. The league's squads have taken turns defeating each other as part of a parity-filled first half of the Big East schedule. But what that means is that several clubs are still in the mix for a possible berth in the Class 3-A State Playoffs -- including the Franklinton Lady Rams. 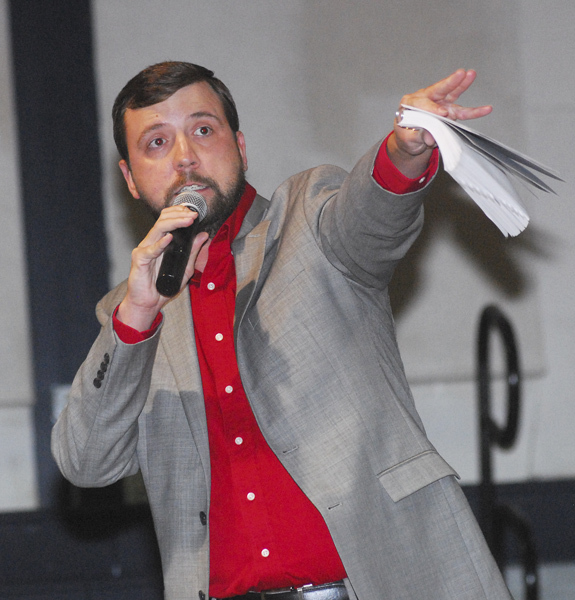 LOUISBURG -- Working together for a common cause was the chief focus of Louisburg College's First Annual First-Pitch Gala last Saturday at the Taylor Center on the LC campus. The event was coordinated by the school's softball and baseball squads in order to raise money for the programs. ZEBULON -- The Milwaukee Brewers have announced that Joe Ayrault will once again return as manager of the Carolina Mudcats for the 2019 season. Ayrault enters his third year as manager of the Mudcats and will be joined this year by Pitching Coach Cameron Castro, Hitting Coach Bobby Bell, Coach Fidel Peña, Athletic Trainer Matt Deal and Strength and Conditioning Specialist Jonah Mergen. 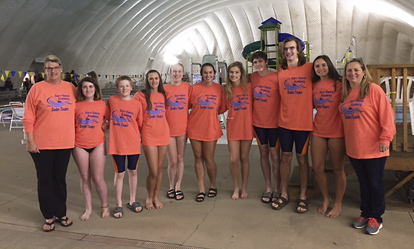 HENDERSON -- Kerr-Vance Academy's first-ever swim team, coached by Elizabeth Richardson, is headed to the state finals in Greensboro on February 11. The event will be held at the Greensboro Aquatic Center. Swimmers had to earn qualifying times in various regular season events to earn this trip. DURHAM -- Looking for something unique to get your Valentine this year? Send that special someone a Wool E. Gram delivered personally by Wool E. Bull himself. You'll need to act fast, though, as Wool E. Grams are limited and sell out every year. CHAPEL HILL-- Janiya Downs from South Rowan High School and Jordy Lopez from Bunn High School have been named recipients of the NCHSAA Performance of the Week awards. Each week, two athletes in North Carolina High School Athletic Association competition are selected for this award from nominations received from media and school administrators. 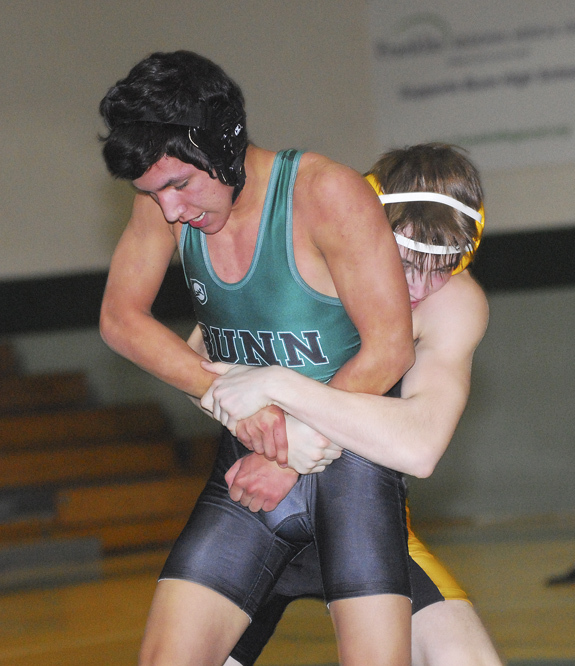 Bunn's Octavio Acuna (left) tries to avoid a hold attempt during last Wednesday night's Northern Carolina Conference mat showdown versus rival Roanoke Rapids. Franklinton's Zack Carver (bottom) competes in a match against at the Big East Conference Individual Wrestling Tournament, which was held last Saturday at Southern Nash High School in Stanhope. 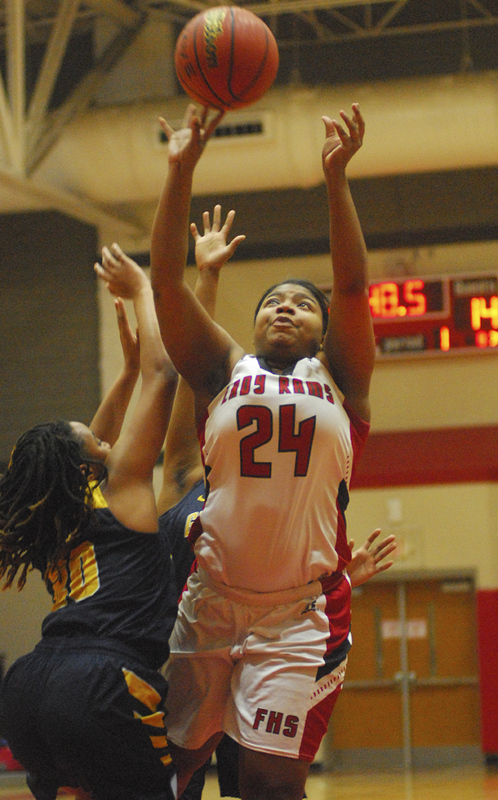 Franklinton High School's Laquasia Clifton scores in the paint for the Lady Rams during last Friday night's home outing against league opponent Rocky Mount. Franklinton's Russell Dennison tries to gain an escape during last Saturday's action at the Big East Individual Wrestling Championships at Southern Nash. 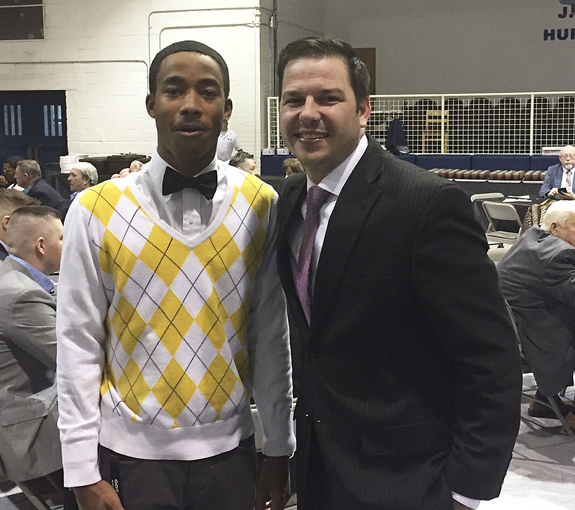 Former Louisburg High School multi-sport star JyQuan Taylor (left) poses with LHS hoops coach Michael Sheldon during last Saturday's First-Pitch Gala at Louisburg College. Taylor is now a freshman member of the Hurricanes' baseball squad. On Feb. 18, 1916, The Franklin Times announced that the First National Bank, located on the northwest corner of Main and Nash Streets in Louisburg, had erected a "magnificent electric illuminated clock" on the front of its building. According to Frank B. McKinne, the bank's cashier, the officers installed the clock in appreciation of the public's valuable patronage. Issues relating to the heart affect both men and women, and an estimated 15 million adults in the U.S. have coronary heart disease, the most common type of heart disease. 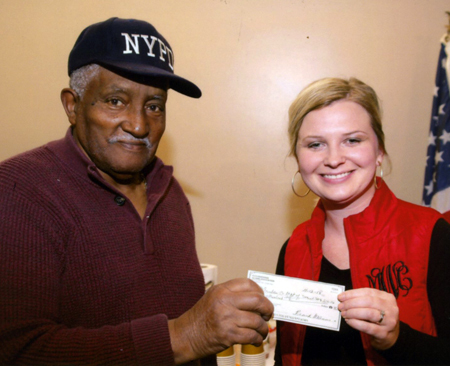 In the photo above, Frank Manns, treasurer, presented Megan Wilson from the Franklin County Department of Social Services with a holiday check for a needy child in Franklin County, which hopefully brought a smile to that child's face during the holidays. Kerr-Vance Academy in Henderson recently released the second quarter and first semester headmaster lists and A/B honor rolls. 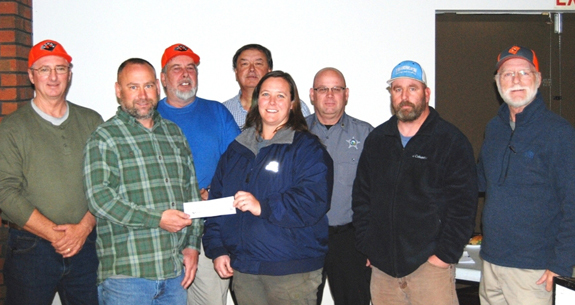 The Franklin County Hunting Dog Association (FCHDA) celebrated its first year in existence last Tuesday, Jan. 22, at the Louisburg Moose Lodge just east of Louisburg. The Association is stepping up and doing what it promised it would do: Standing up for the ethical and humane treatment of hunting dogs and the hunting dog sport, according to Gary Faulkner, an officer of the group. LOUISBURG -- A Franklinton man who spent more than a year in jail awaiting trial on assault charges was found not guilty recently. Now, Craig Lamont Dozier, 43, is undertaking a personal crusade to "expose" what he alleges is a system that falsely imprisoned him and violated his rights in jail. "I want ... to expose their negligence," Dozier said recently, days after a Jan. 9 trial in court exonerated him. "... I want them exposed that my rights were violated as a U.S. citizen. JOB WELL DONE. At its annual Christmas dinner on Dec. 17, Franklin County Farm Bureau, Inc. recognized outgoing president, Bennie Ray Gupton, for his many years of service as board member and president of the general farm organization. Gupton volunteered over 55 years on the board, with 42 of these as president. 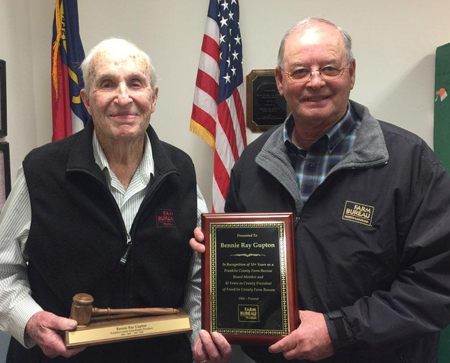 Shown in the photo above are Bennie Ray Gupton (left), and incoming Franklin County Farm Bureau president Steve Nelms. LOUISBURG -- Police continue to look for suspects in an armed robbery. According to authorities, two suspects wearing dark clothing and hooded sweatshirts entered the Verizon Store on S. Bickett Boulevard the evening of Jan. 24. Employees and customers were inside the store, police said, but no injuries were reported. GREENSBORO -- A Franklin County teen is slated to appear in court in February on homicide and arson charges. Guilford County authorities arrested Chris Adrean Collins on Jan. 23, alleging he set a fire at a home in Greensboro, killing a 55-year-old man and a 44-year-old man. Collins, 18, was charged with two counts of felony murder, first degree arson, two counts of felony robbery with a dangerous weapon, and felony kidnapping. ZEBULON -- Sheriff's deputies are investigating an arson and assault case. According to authorities, officers responded to a fire call on Lemmie Drive in the Zebulon area of Franklin County on Jan. 27. Authorities arrived to find a vehicle on fire. There was no one inside.